Buy the Book during Launch Week! To express our gratitude to you for your help with a strong launch we have put together an amazing package of parenting resources worth over $400 that we want to give to you for free just for helping us. 2. Email, fax, or mail us your receipt. Be sure to include your email address so that we can tell you how to obtain your free gift. Email:Gift@biblicalparenting.org Fax: 609-771-8003. Mail: 76 Hopatcong Dr. Lawrenceville, NJ 08648. That’s it. It’s simple. We will give you hundreds of dollars worth of parenting tools just for helping us in the launch that first week. The offer is only good during the Launch Week. 3. Just one more thing. Would you please help us now by telling all your friends about this offer. Please post it, tweet it, email it, link it, and talk about it. 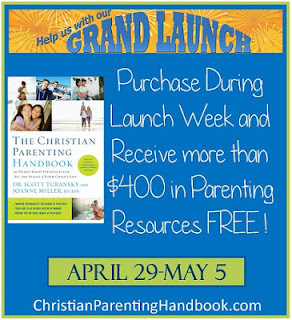 READ MY REVIEW on "The Christian Parenting Handbook" and enter my giveaway with 5 great prizes to win!